Sunday was a day of contrasts. The morning was glorious. We had the opening Eucharist at the Cathedral. It was overwhelming to walk down the center aisle through the rood screen to the high altar. I was thinking of all the people that have walked this way in the past fifteen hundred years. That is both humbling and inspiring. The music and liturgy were glorious. In the afternoon, we had the first working session. I think that after three days of retreat and the wonderful Eucharist I had forgotten how much work is in front of us. 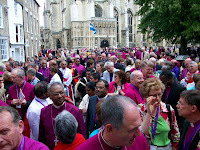 The Archbishop and the Design Team have created a new structure that puts us in groups of about forty bishops for intense conversations over many issues, but particularly those threatening the unity of the Anglican Communion. There will be no votes, but there will be team of bishops who are to reflect in some written way what is being said. Clearly the objective is to get a reading on where the bishops are in terms of the proposed Anglican Covenant. There was also a reference to the Windsor Report and its conditions. Whatever comes out of this meeting in terms of the Covenant will then be presented to the Provinces (that is our national church) for input. 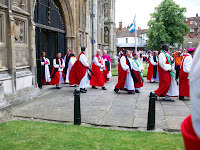 A new draft will be circulated in time to go the Anglican Consultative Council meeting in May 2009. There are many difficulties here. We come from different places and with different experiences. What I find disheartening is the amount of misconception about the Episcopal Church. Many bishops have misconceptions about our theology as well as our responses to the discord in the Communion. We have many bridges to build in the next two weeks. The Archbishops opening address is on the Lambeth Website and will give you an idea of his intent in the format of the Conference. So today (Monday) we begin the work. Keep me in your prayers as I keep you in mine.